Control your AI Bear by your voice. You can choose to help sleep music with (white noise)、 (brown noise)、 (bird sounds)、(seawave sounds) 、(frog sounds), also set the sleep for 10~90 minutes with the auto off timer. Setting the time is as easy as talking. Tell“ Hello cutie pie ”your time and you're all done. No more messing around with switches, buttons, or complicated setup procedures just to set your time. Please remember that the " Hello cutie pie " is the Trigger Word of this product. If you forget other commands, please ask the product with the " What can I say ? "command. 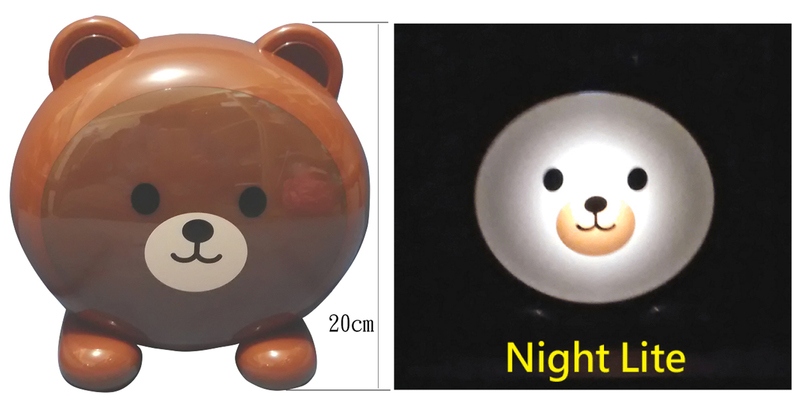 If you're having difficulty sleeping, the AI Bear can help by playing White Noise or Brown Noise loops. People who sleep hard are more stressed when they see the clock hands or numbers on the alarm clock then it is more difficult to fall asleep. This is the world's first alarm function without clock hands or numbers which is with White Noise and Brown Noise to help sleep. White Noise or Brown Noise is like a wall, masking the interference of environmental noise, can make the brain not feel the change of the environmental sound, so that you can sleep better when you sleep lightly and it is not easy to wake up. Due to unknown audio source trigger the product, in order to avoid disturbing the user in the deep night. When at the (Set Sleep), (Sleep Now), after the playback ends, will automatically turn on the night light mode. Tell the product at any time: (Hello cutie pie, Rest Well!) The command is to instruct the product to enter the sleep mode and the night light will be turn on. This product will respond: (Okay, Goodbye! ), if you need to restart, please press the button once, the product will respond: (Hi, I am back! ), of course, the time and alarm function are not affected. We recommend listening to 6 different kinds of relaxed music, and then choose to listen to White Noise or Brown Noise, so that you can relax and eliminate noise, help you sleep, double massage your brain, and improve sleep quality. This product is controlled by voice and is suitable for visually impaired. Play White Noise or Brown Noise on the those restless nights. * Bear size: 20 * 20 * 10 cm. * Interactive guide via voice prompt. * Reduce Stress, Sleep Better, Improve Focus. * Up to 20 languages supported, OEM/ODM service. * Idea for Home, Office, Dorm, Kids Room or Nursery....etc. * Enjoy 6 relaxing music, let you relieve stress, cheerful mood. * USB cable is included, but the DC 5V adaptor is not included. * The secret is the soothing sound of White Noise & Brown Noise.